So, today was Thanksgiving, and I did indeed bake some Babycakes goodies and made The Soup Of Enlightenment. (YUM!!) I also made some Tuscan Mashed Chickpeas on page 42 of Barefoot Contessa Foolproof. It’s similar to hummus, but no tahini (sesame paste.) It’s literally two cans of chickpeas (aka garbanzo beans) some chicken broth, added to some cooked tomatoes, minced garlic, parsley, salt and pepper. I’ve heard a new slang term that I think truly describes many a kitchen disaster: The Hot Mess. I was watching the first episode of the new Hot In Cleveland season online (on TVLand.com, OK?) and heard Valerie Bertinelli’s character Melanie use that term to describe her new job situation. What it came from was describing someone, usually female, who is, well, a mess–bad dresser, drinks too much, whatever. Lindsay Lohan fits this description perfectly; so does Britney Spears. A “hot mess.” Bigger mess than the usual. While making my delish Tuscan Smashed Chickpeas, I started thinking about many a “hot mess” I’ve had in the kitchen, and while they were not fun when they were going on, they’re pretty amusing now. . .and better with no witnesses. Like the Thanksgiving a couple of years ago when I was slicing onions to brine a turkey the day before. My aunt called, and I wanted to talk to her, so I did. While using one of those mandolins to slice onions. I forgot to pick up the holder thingy, and when I got to the bottom of the onion, my thumb hit the blade. Sharp blade. Sharp hit. Lotsa blood. None got anywhere else but the two dishtowels I grabbed to stop the bleeding. Didn’t go to hospital, and it healed up all by itself. Eventually. I did that once before, slitting open the middle finger of my right hand–not my driving finger, thankfully. I was trying to separate frozen sliced cheese so I could make my new husband a sandwich. No, I didn’t bleed on that, either. But I did go through some bandages that week. A couple of years ago I bought a head of cauliflower because it was on sale, and finally decided to just roast it in the toaster oven on the convection setting. Well. . .it roasted all right. It was burned to a crisp. DARNIT. A whole head of cauliflower into the trash. I set it aside to cool, and I just idly picked up a piece and ate it. I’m serious–if you don’t like cauliflower, BURN IT! It gets rid of the chalky taste and it’s SOOOO GOOD. That was an accident that turned out good. They don’t all turn out that way. “Hot mess” would also be a good way to describe the last attempt I made at making gravy from the turkey. I don’t LIKE gravy, therefore, I don’t MAKE gravy. Every year someone *else* has made gravy. I stay away from it, because it truly was a mess the last time I tried it. And they never let me forget it, either. About ten years ago, I had just moved in with my very good friend in La Marque, TX (formerly known as “ex-boyfriend,” but that’s another story.) He’s a widower, and we were going to his mother-in-law’s place for Thanksgiving. Me, nervous. A week or two before, I made some sweet potato frites from that month’s issue of Martha Stewart Living for dinner, and they were SO GOOD! We couldn’t stop stuffing our faces! I decided I’d bring them to Thanksgiving dinner. My delicious sweet potatoes were a hot mess. Ditto that goat-cheese and fig salad I brought, with the balsamic dressing. The hostess, a very nice lady, brought me some Wish-Bone; she didn’t realize that I’d already dressed it. And I never did THAT again. . .but at least I tried. Whenever I cooked him breakfast, it became a game to see if I could get his eggs “over easy” just the way he liked them. Sometimes I did, sometimes I didn’t. There was one day that I made a breakfast that, he claimed, stunk up the whole house with the onions, and he had to leave the doors open to get the cooking odors to go away while I was working. That’s when the stray cat got in the house, and my brave feline Kismet ran that cat up the street. Oh, and I never made that one again. Another time I decided to try a Suzanne Somers recipe for Beef Curry. I admit that I’m not completely familiar with Indian, Thai and Vietnamese cooking, but this looked pretty simple. I found curry paste in my local HEB, and went to town on this 20 minute beef curry. Let’s just say that HE went to KFC for dinner that night. Oh, that’s a recipe I’ll never try again. Nobody could tell me what curry was hot and what wasn’t, and of course, the one I got was BURNING HOT. I try to be frugal, but this went out. Neither of us could stomach it, so KFC it was that night. And, believe it or not, we’re friends today. Amazing. Then there was the day I roasted my own garlic in the oven. I bought one of those little clay bakers, and did not, at the time, own a countertop (aka “toaster”) oven like I do now. Well, after an hour in the oven, the garlic wasn’t the soft, smushy thing the box said it would be. So I put it in the microwave to bake a little longer. We’ve all done this, right? A few minutes later, the light is off, or so I thought. The microwave oven was filled with smoke. I opened the door and smoke came billowing out, and the garlic was ON FIRE. Yes, it ignited, and all I could do was grab it with metal tongs and dunk it in some water in the sink. And that was the last time I attempted to roast garlic. Unfortunately, mine didn’t. That bottom layer, the meringue, went flat. As in pancake flat. So I chopped up some fruit and took it as is. Over the river and through the woods to the folks’ place. Tasted pretty good. Fortunately, nobody but me knew what it was, and that it was not supposed to be flat. 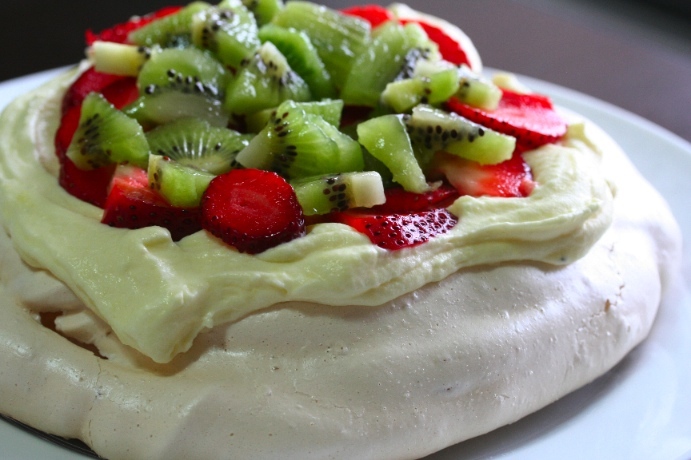 I have since made pavlovas successfully, albeit not for family members. Do you eat microwave popcorn? No, I don’t–not anymore, for a couple of reasons, namely the toxins that make the stuff taste good. But I admit, I did buy it at one time, oil, toxins and all. I was not at home, and not alone, with a friend of mine and we were going to have some. It didn’t all pop; a significant amount ended up un-popped. So we put it back in the microwave and tried again. Flame. In the microwave. Any questions? She swore she would never tell anyone what happened, and she didn’t; she passed away about a year later, but not from the popcorn. There are some things we do NOT try, and they don’t tell you about stuff like that on TV. Especially not cooking shows. Then again, I’m sure there’s a blooper reel from every cooking show on The Food Network. But one it ever got out, I bet Giada de Laurentiis would sue! Just kidding, Giada. I know you don’t make mistakes on camera. Speaking of Giada, just earlier this year, when her new book came out, Weeknights with Giada, I bought it ahead of time to get the much-desired ticket to get into the signing. I tried one of her recipes, and, well. . .I screwed it up. Used a garlic-flavored oil when I shouldn’t have, and did something else or forgot something else. . .it was edible, but didn’t taste the way she intended. So when I got to talk to her, I said, “Hi, Giada. I screwed up one of your recipes last night.” Giada said, “Uh, oh, what’d you do?” I told her. My bad, I know. But it wasn’t as big of a hot mess as some have been. And I made that recipe again, the RIGHT way. Oh, and when I cook with tomato sauce, especially a lot of it, my kitchen looks like a crime scene. I am proud of this. Yes, I clean it up, too. Numerous mistakes have been made by NOT reading the recipe, but for the most part, I over came them. Thank heavens. I have a brother who will tell you to never eat my cooking, because “Amy can’t cook.” I can, but. . .well, I tried to cook for him a couple of times, Let’s put it this way–he sent me an apron for my birthday that says, “Last time I cooked, almost no one got sick!” He even writes songs about my cooking. Or rather, he re-writes songs about my cooking. Maybe I’ll post the lyrics to one he re-wrote for me, called Amy’s Back in Austin. Maybe I should send it to the group who wrote the original, a band called Little Texas. It’s actually a pretty good tune, even though I’m not a country fan, but I don’t think they ever thought someone would parody it like that. Why would a brother say such things about his sister’s cooking? After all the fabulous desserts transported over 350 miles to New Orleans for holidays? Well, it goes like this. . . When I got married in 1996, my friend JS gave me a copy of Martha Stewart’s Quick Cook Menus. I still have it, and even used a recipe from it just recently. Well, I still lived in New Orleans, and my brother, his wife and daughter lived here in Houston. (We’ve swapped since then.) They visited for a week, and I made sure I not only invited them for dinner, but made something fantastic from that book. The Chicken Cacciatore with angel-hair pasta. The salad with the creamy balsamic dressing. The garden soup from that month’s issue of Martha Stewart Living. The raspberry cobbler with the biscuit topping. It was FAAAABULOUS, I tell you. In my world, it was. The Queen would have been very pleased. But this wasn’t the Queen I invited to dinner. The next day, I got a call from my brother: “What was in that soup?” Seems that my niece, who was then about 15 or so, was, well, hurling all night. Didn’t affect anyone else, just her. Ahhhh. . .then my sister-in-law tells me that she’s allergic to raspberries. . .but she forgot that she was allergic until after she’d eaten some. Needless to say, I’ve never cooked for them again, and he continues to write songs about my cooking when the muse visits him. Others have told me of their kitchen disasters. My good friends in Australia have also had their share of them. The wife, a teacher who graduated from LSU in Baton Rouge, told me that she’d once made a birthday cake for her husband when the beaters broke in the cake. She thought she got all the parts out, but just to be safe, they were very careful when they ate it! My mother told me one of my favorites–she always baked birthday cakes for kids’ birthdays; ours as well as relatives, since she was the best at it, particularly the decorating part. (Mom also convinced me that I would not be able to bake my own wedding cake. I could have, but. . .it was easier to let someone else bake it.) For my 17th birthday, I requested, and got, a chocolate rum cake–but no, it wasn’t boozy or anything. Mom had a stand mixer from Sears, (circa 1975, I think) and didn’t use it every day, so it was in a cabinet most of the time until it was needed. Well, it was nearly May 9th, her own mother’s birthday, and Mom made a cake for her, too. She put all the ingredients into the mixing bowl, turned it on, and out the other end was a big roach! It had been living in the motor case for an indeterminate amount of time, and turning it on rattled its cage. Nothing got INTO the batter, it ran in the other direction. Thank heavens, or one of us would have been sent to the store to get more cake mix. I suppose the last hot mess was the last toaster oven I had. I killed it. Six years after I received it for a Christmas gift from the aforementioned very good friend, it stopped working, and I bought another one. I really don’t want to be without one, and of course I bought the newest Cuisinart model with the convection setting, timer and exact-heat sensor on it. (On sale at Bed, Bath & Beyond, with a coupon, of course.) I use it more than the one in the stove–you can roast a whole chicken in it! Yes, I do it, too. That’s enough for tonight. I’d love to hear about your kitchen disasters, the ones you can laugh at now. (Someone losing a finger or toe is NOT funny, really.) Post them below in the comments. . .if you dare. Posted by Amy on November 22, 2012 in Considered opinions, Cookbooks, Holidays, Ingredients, Special Occasions, What's for Dinner?